NATE began in 1997 and has grown to become the nation’s #1 non-profit certification program for heating, air conditioning, refrigerant and ventilation technicians. NATE is the only nationally recognized technician certification organization, developed and supported by the HVACR industry. As and independent non-profit certification entity, NATE’s tests have been developed by a committee of industry experts to challenge event he most experience technicians and drive them toward technical excellence. The Nebo Comfort Systems technician working on your home or office is NATE certified and that means he is a better-trained, more knowledgeable and more professional technician who is determined to provide excellent service and has the experience and certification to make it happen. The US Environmental Protection Agency is charged with helping us to protect our earth’s ozone layer. In Section 608 of the Clean Air Act the EPA enforces regulations that protect the ozone in residential and commercial stationary air conditioning and refrigeration systems. EPA-608 certification was developed to ensure companies and technicians were knowledgeable of and skilled in practicing a variety of practices in the air conditioner service and refrigeration reclamation processes. 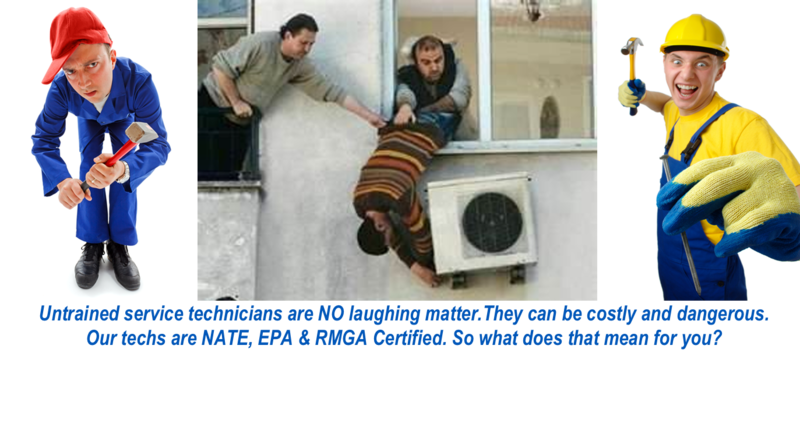 Any technician performing maintenance, service, installation or refrigerant disposal should be certified. Most utility rebate and government tax rebate programs require proof of your technicians EPA-608 certification. Our technicians are not only EPA-608 certified, they have continued their education and training to bring you the newest information and opportunities in improving your system’s efficiency. They are here to help you save money and help you protect the environment. Since 1943 the RMGA has been serving the heating, venting, air conditioning and refrigeration industry. Devoted to improving the industry through education, RMGA developed a training and certification program that has become a model from other industry associations. In 2002, the Utah State Legislature pass the Gas Technician Certification Law requiring all technicians who get paid to work on gas appliances to prove their competency by passing the RMGA certification exam. As an instructor in UVU’s HVAC Apprenticeship Program for 13 years, Robert Moore has not only passed the RGMA certification, he helped develop the very test now mandated by Utah state law. Unlike many companies that only require the supervising technician to get RMGA certified, Nebo Comfort Systems is committed to making sure all their technicians are RMGA certified. Many manufactures also provide education and certification for installers and service techs. These are excellent opportunities for continuing education that our company is committed to taking advantage of to ensure the best service for you. So what does all this give you? What’s in it for me, you might say? technicians you know you can trust and experience they can prove? At Nebo Comfort Systems there just isn’t. Don’t settle for boasts of vague certifications, ask for proof of these industry standards and keep that peace of mind you deserve while we keep you comfortable.